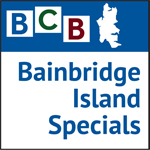 In this 20 minute podcast, recorded at a forum held by the League of Women Voters on Monday evening, October 9, at Bainbridge City Hall, we hear briefly from each of Bainbridge Island’s candidates for City Council. Listen here as Ted Jones and Matthew Tirman from the South District, Rasham Nassan and Wayne Roth from the Central District, and Joe Deets and Kevin Fetterly from the North District each briefly introduce themselves and answer two questions posed by audience participants. Sadly, additional questions during the evening’s presentation were not recorded due to technical difficulties. 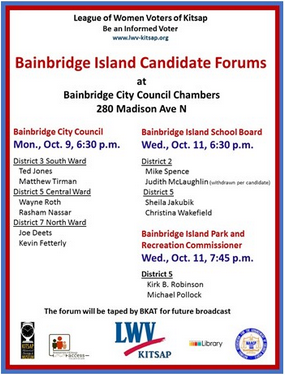 Thank you for listening and for your patience; we hope to record all of Wednesday evening’s session with the Parks and Rec and School Board Candidates, so stay tuned!